Dimitrios Pagourtzis in a photo provided by the Galveston County Sheriff's Office. THE TEXAS STUDENT charged in the shooting at Santa Fe High School described planning the attack in private journals, including a plan to kill himself. He also posted an image on Facebook of a ‘Born to Kill’ shirt and used his father’s shotgun and pistol in the rampage that left 10 dead and 10 wounded, authorities said. 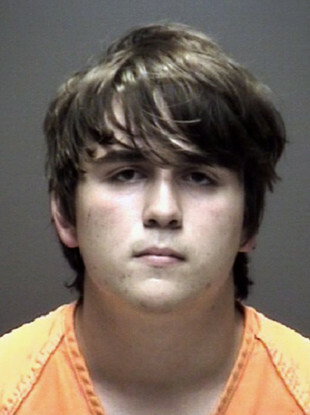 A motive wasn’t immediately clear, but Governor Greg Abbott said Dimitrios Pagourtzis, 17, wrote about planning the attack in journals on his computer and in his cellphone that police obtained. That was inconsistent with the portrait painted by his friends – a reserved young man, an athlete who had discussed wanting to own guns but didn’t talk of killing people. It may have been what Pagourtzis hoped would happen, as according to an affidavit filed yesterday when he was charged with capital murder, he told investigators that he didn’t shoot students he liked “so he could have his story told”. “Not only did he want to commit the shooting but he wanted to [kill himself] after the shooting,” Abbott said, adding that Pagourtzis told authorities he “didn’t have the courage” to take his own life. Abbott said at a news conference that “unlike Parkland, unlike Sutherland Springs, there were not those types of warning signs.” He was referring to the Valentines Day school shooting in Florida and one in November inside a church in a town near San Antonio. Abbott said the early investigation showed no prior criminal history for Pagourtzis – no arrests and no confrontations with law enforcement. That same Facebook profile that included pictures of the “Born to Kill” shirt – which one classmate told The New York Times that Pagourtzis was wearing Friday – described Pagourtzis as planning to enter the US Marine Corps next year. But the Marine Corps told The Associated Press it has reviewed its records and found no one by that name as either a recruit or a person in their delayed entry pool. Branden Auzston, 17, a junior at Santa Fe High School, said he was sitting in his history class watching a movie when he heard the fire alarm. At that moment, he thought it was just a fire drill, so he and his girlfriend, Daisy Sullivan, walked outside the building with other students. But Auzston said he thought it was odd the school was having another fire drill after having had one about two weeks ago. Tristen Patterson, a 16-year-old junior at Sante Fe, considered Pagourtzis a friend. He said Pagourtzis was into video games that simulated war, and that he sometimes talked about guns – firearms that he liked or wanted to get. “But he never talked about killing people or anything like that,” Patterson said. Email “17-year-old charged with Texas school shooting 'planned attack in journals'”. Feedback on “17-year-old charged with Texas school shooting 'planned attack in journals'”.